Here is a pack of worksheets for students to practice identifying less when comparing money amounts. 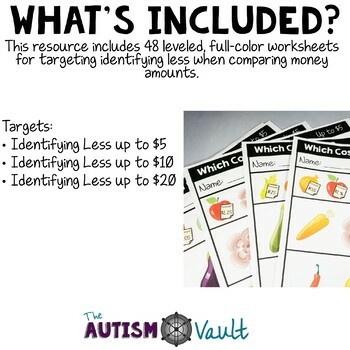 Students can practice identifying which items cost less with these 48 full color worksheets. 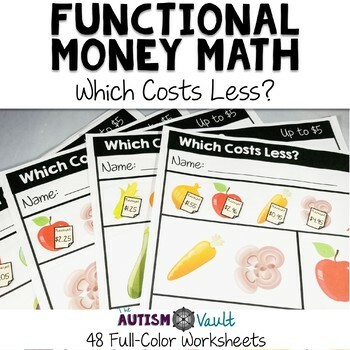 Each worksheet set targets a different level of learning to compare money, so they can be used through introduction of the skill until they meet mastery and maintenance. There are 2 types of worksheets for each level. Earn TPT credits for leaving feedback! Leave feedback on this product to earn credits which you can use on future purchases. Permission to copy for single classroom use only. Electronic distribution limited to only single classroom use only. If you would like to share this with a friend or colleague, please ask them to visit my store and download the file directly.